15 Years ago today and Dandy had discovered Belgium. Odd.... One of our 2-foots (the one with no fur on the top of his head) gave us our treat stick REALLY early this morning, and then told us he was going to Belgium, the other one is still in bed. Does anybun know where Belgium is, or for that matter WHAT Belgium is (I hope it's an allotment). Golly, what a weekend you had. 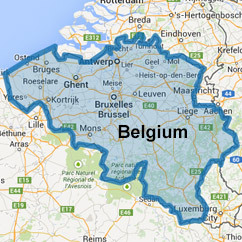 We are not sure where Belgium is either. We asked Honeybunny being the eldest, but she did not know. Perhaps it is an allotment. Please do keep us posted. Well, one of our 2foots keeps reading about this thing called the european union. Belgium is supposed to be part of it. I think they are like tesco allotments and you get lots of different ones in different places. Well all I know is he's back now, and he didn't bring us a thing!